Prof. Dr.R.S.Hariharan, MBBS,MD – Hariharan Diabetes & Heart Care Hospitals (P) Ltd.
Prof. Dr.R.S.Hariharan, MBBS, MD (Internal Medicine) is the Chairman and Chief Physician of Hariharan Diabetes and Heart Care hospitals and the Director of Hariharan Institute of Diabetes. He graduated from JIPMER, Pondicherry in 1970 and Madras Medical College in 1979. He is active in private practice from 1979 in Nanganallur. He is the founder of the hospital and is responsible for establishing Diabetes and Heart care in this part of Chennai. He served in the Indian army as a short service commissioned medical officer for 5 years from 1971 to 1975. 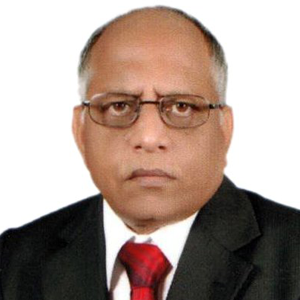 He had served in the Tamilnadu Medical Services from 1978 to 2005 in various capacities and retired as the Professor and Head of the Department of Diabetology, Madras Medical College and Government General hospital in 31.10.2005 on attaining the age of superannuation. Dr. R.S.Hariharan is a very good speaker and teacher. He has been participating in many medical and Diabetology meetings as a renowned faculty. He has won many awards and titles including Eminent Professor award, Best Doctor award, Best Mentor award etc. He is a member of many medical bodies and has published many papers in national and international journals. His areas of special interest are Diabetes and Heart, Diabetic Foot, Pregnancy Diabetes and teaching students and young doctors.